Lawrence Rush is a composer, lyricist, bookwriter, singer, actor, teacher and musical director. His musicals, Pride & Prejudice - the Musical and Winter of the Fall were Richard Rodgers Award finalists. He co-composed Rules for Girls, which was nominated for an L.A. Weekly Theater Award for Best Musical and composed A Maiden’s Consent, a bi-lingual musical which twice toured the U.S. He made his Carnegie Hall composing debut last year with his piano work “Transitions”. 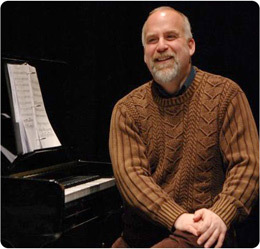 His songs, art songs and award winning choral pieces have been heard around the country and in Europe, and have been recorded by Broadway performers such as Laura Osnes and Ron Bohmer. Lawrence was a member of the San Francisco Opera Chorus, where he also sang and covered roles. He sings with several professional choral groups, was the youngest member of the Young Americans, and has performed many roles in opera and musical theater, including George in Sunday in the Park…, Peron in Evita, Lenski in Eugene Onegin, Frederic in Pirates of Penzance and Bob Cratchit in a tour of Scrooge, the Musical. Lawrence has been teaching, vocal coaching, conducting and music directing with such organizations as Manhattan College, TADA!, Steps on Broadway, afterschool programs and privately. He is currently readying Pride & Prejudice - the Musical for a workshop, working on a multi-media work about Poe, and recently completed a new musical entitled “A Laughing Matter”. He holds a B.M. in voice from California State University at Northridge.